At the time, I wasn't sure how the second URL would work as I only had an iOS device. Now, I have a Nexus 7 tablet so I can update the instructions for the Android OS. At left is a screenshot of my Nexus 7 home screen. The icon for my weather station app is in the red circle. Screenshots are easy with the Nexus 7. Simultaneously press the power and lower volume buttons. It will go "plink" and put the image where you specify. Since this was an Android device, I tried the URL m.wund.com first. While it worked fine, the data from somebody else's station was displayed. I could not find a way to change to my own station with this version. On a hunch, I tried i.wund.com next. Even though this is an Android device, the iOS version seems to work fine. It also provides the option for choosing your own station when there are several available. 1.) Open your mobile device browser (it's Chrome on the Nexus 7) and navigate to i.wund.com. 2.) 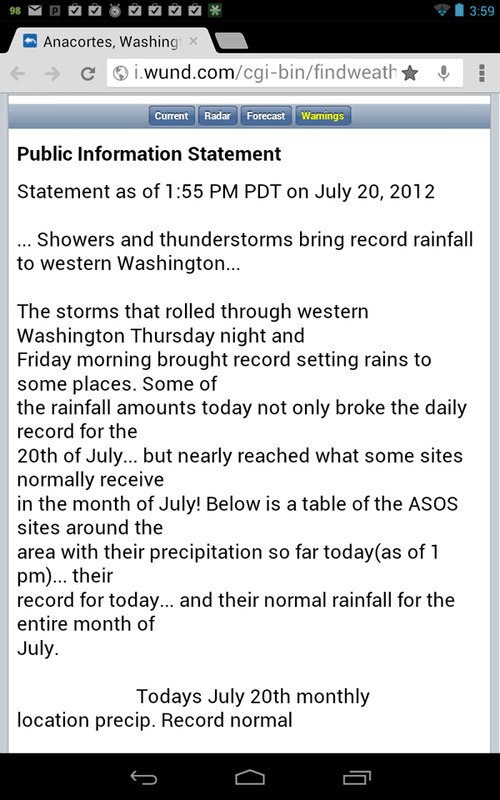 In the search box, type the zip code or city name corresponding to your WU weather station account. 3.) 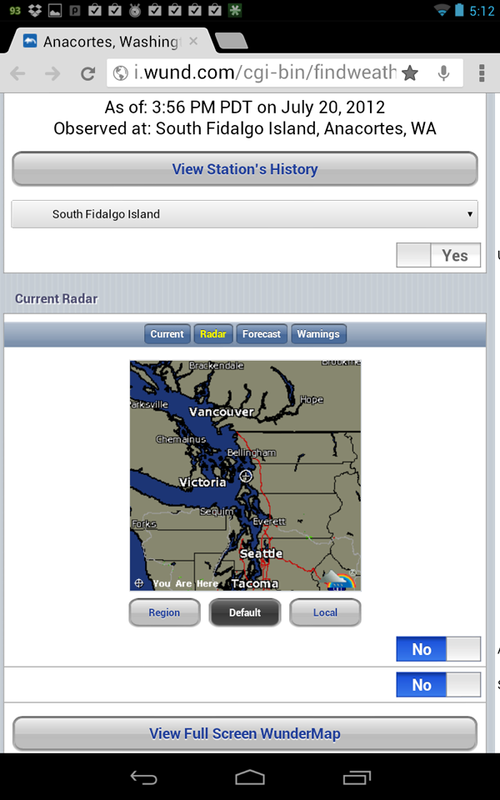 Scroll down to the button "View Station's History." The slider under it should be on "Yes." 4.) If it's not already showing, choose your station from the dropdown. 5.) When you have verified that the correct station is displayed, save the website as a favorite. Touch the star in the address line if you are using Chrome and add it to your Mobile Bookmarks. 6.) Open your bookmarks and you will see the WU icon. Touch and hold on the icon to open a menu. At this point, you can rename it ("Edit bookmark") if you wish. Touch "Add to home screen" and you are finished. 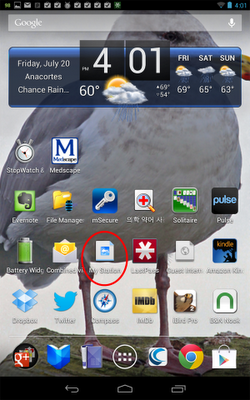 When you return to your home screen, you will see the icon as in my example above. If you have a website associated with your account that is posted at Weather Underground, touch the button "View Station's History." Scroll down to the section "About." You will see a button with a link to your site. 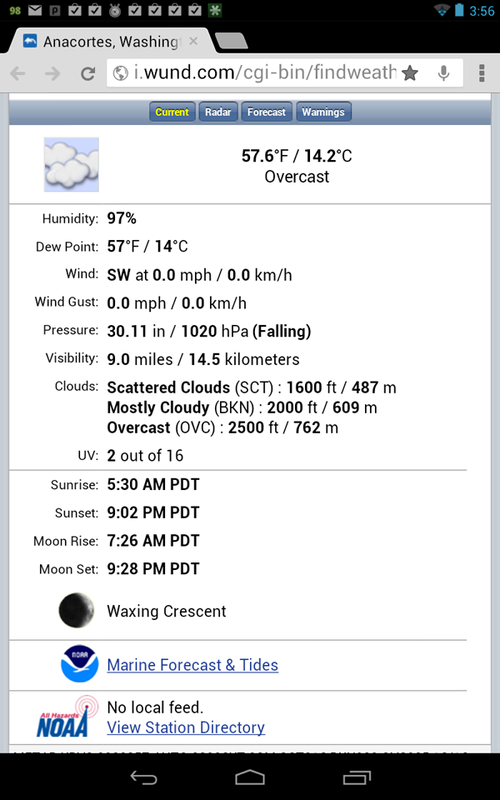 The Weather Underground station app includes a radar image, detailed forecast and warnings for for your area. 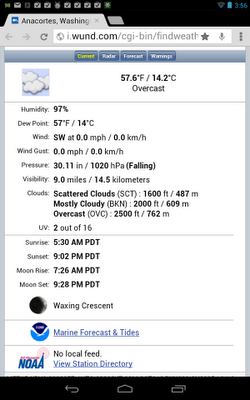 This makes a very nice and sophisticated weather app associated with your station. I have really enjoyed getting acquainted with the Nexus 7 tablet. It's a wonderful device that puts the iPod to shame. 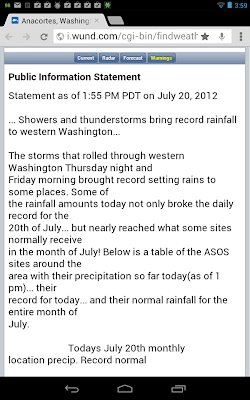 I am also pleased to be able to update the original weather station app post to include Android devices.